Chess refers to a board game played by two people on a chessboard. The chessboard is characterized by a square-shaped checkered board with sixty-four squares that are arranged using an 8x8grid. It is a famous game worldwide so it is no longer surprising if you will see millions of people who are drawn by it and play it regularly in clubs, tournaments and even online. The two players of the game starts with 16 pieces: 8 pawns, 2 bishops, 2 rooks, 2 knights, a queen and a king. These pieces are what the players use in attacking each other and capturing their pieces. The aim of the game is to checkmate the king of the opponent by ensuring that it is placed in a threat of capture which it can no longer escape. A winner may also be declared if the opponent voluntarily resigns from the game. It should also be noted that each piece moves differently and you have to master all these moves if you want to have an easier time winning the game. Winning the game requires you to use your brain in creating strategies that will allow you to capture the king of your opponent. You have to improve your ability in setting up positioning advantages that will serve you for a longer time during the game. This means that you have to know exactly where to place the pieces to instantly take complete control of the game. 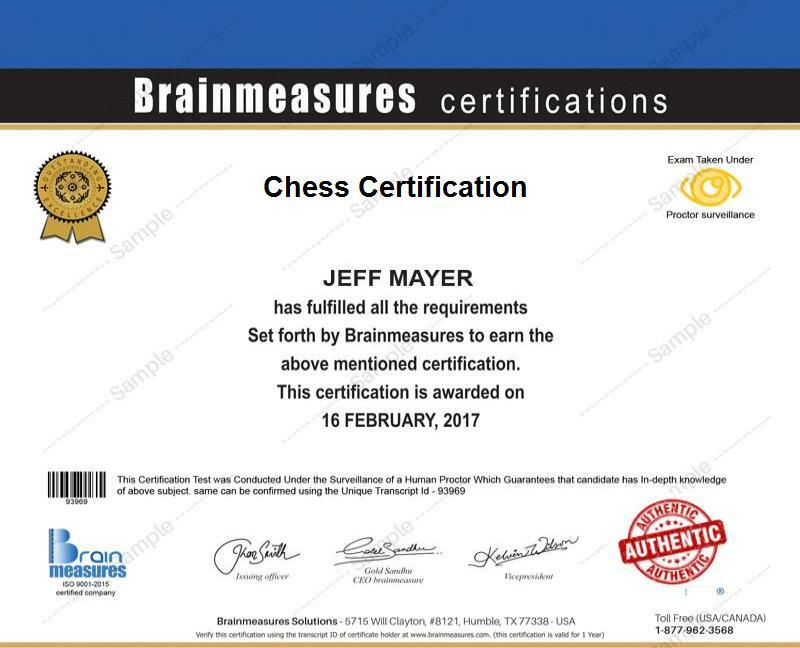 Becoming an expert chess player is not that hard to achieve if you take part in the chess certification program which is now available at Brainmeasures. You can expect the chess course offered by this highly reputable online certification company to be extremely beneficial because it allows you to instill within you the best mindset of a good chess player. By enrolling in this chess certification course, you will allow yourself to undergo a highly comprehensive chess training which works in helping you understand the basic movements of all the pieces in the game and the best strategies that you can formulate to beat your opponent. It will also allow you to master the mechanics of the game while getting more familiar about the most successful chess players and the strategies that they have used in their games. This will make it easier for you to create your own tactic. By getting your chess certificate, you will no longer find it hard to impress the public with your skills and expertise in the game. The chess certification program which is now available at Brainmeasures is a huge help to a wide range of individuals and professionals who dream of learning everything about chess. This is most suitable for you if you are an aspiring chess player who wishes to build up your skills in this game and master all the techniques that you can use once you start to compete with other players. Obtaining a higher level of salary is also greatly possible after you complete a chess certification course. You can use your chess certification to become a chess coach which gives you an opportunity to earn around $54,000 to $66,000 yearly. You can also use your certification to work as a professional and certified chess player which increases your chances of receiving around $44,000 to $80,000 per year.